Josh Eichhörn: looking for love in all the wrong places. Maxine Dragon makes a call to Battle Girl who was supposed to accompany her to the grocery store to help look after the triplets. With Malcolm Dragon currently out of town, Angel has been called upon more than normal though and she could not attend. Angel takes out a group of super-freaks before hearing about how Malcolm has gone to New Mexico with some other heroes to take on a man who has been giving powers to criminals. The kids cause havoc in the store until Thunder-Head arrives to help keep them under control. Meanwhile, a makeshift aircraft created by one of Ant’s allies, Gadget Man, is shot out of the sky above New Mexico. 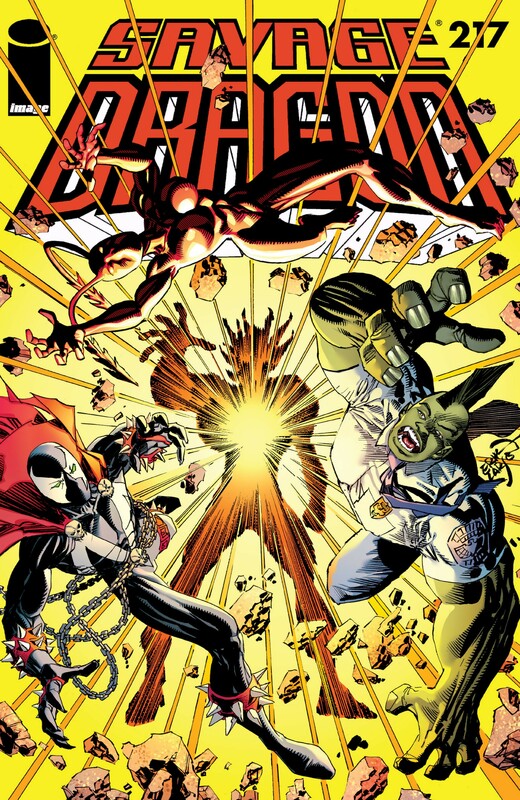 Malcolm, Ant and Spawn are left plummeting to the ground as a legion of super-powered freaks attack them all. The heroes fend off this assault for a while until Spawn grows tired of the fray and proceeds to butcher every single last one of the villains. This brutal act enrages Malcolm as he cannot condone such actions as a police officer. A heated debate soon breaks out between Spawn and Malcolm about their methods with Spawn taking particular issue with how Malcolm seems to be taking the moral high ground. He talks about his disgust with the police being hypocritical with lethal force being used on any young black person over any kind of infraction, imagined or real. Malcolm then being upset with the deaths today seems at odds with how the rest of the police force seems to be. Malcolm dismisses the notion that all police officers are inherently racist or biased against people of color, pointing out the actions of a few should not ruin the reputations of all officers. Ant eventually interrupts the argument and demands that they get into a van she has secured in the hope that they still have some small chance of a surprise attack upon their target, Alzayah Stone, the Mighty One. The heroes set out to approach the villain and hope that the army they have already faced did not have a chance to warn the Mighty One. They debate on how to act with Malcolm being keen to simply arrest him whereas Spawn is eager to simply kill Stone and move on. The heroes reach their destination but the Mighty One is awaiting their arrival. He declares that he is merely preparing the world before an impending disaster by empowering individuals. he can manipulate his own cavern home just as easily as he can the bodies of those he transforms. Ant is buried beneath a pile of rubble, leaving Malcolm and Spawn to take up the battle. Spawn’s cape is partially destroyed which leaves him weakened and so Malcolm alone struggles on against the Mighty One. The fight rages on and eventually Malcolm is able to get through all of the various attacks and defeats the Mighty One. The villain surrenders as he has no wish to die but before he can be taken into custody he is stabbed through the heart by Spawn. This act enrages Malcolm but another cave-in separates the heroes and by the time he emerges from the rubble, both Ant and Spawn have departed.